Around 1k would be more usual, but if 10k works you'd be using less current. ah well that explains something to me! I just checked my 4040 LED's and it appears I had a couple of 1K resistors in there with the 10K ones. I was wondering why some of the LED's were burning brighter than others! Nah, just a factor of 22 or so ... not overall of course, but for every single LED it would be. Yeah I used 1k's on all the leds, I like m nice and bright. I did use diffused leds wich spread the light more evenly. When I dim the lights and switch it on my room looks like a 60's disco . I think I'll need a more beafy powersupply then the arduino though, a lot more leds planned for this one. The sun has been much too nice to do any work on the board but hopefully I find some time over the weekend and finally start on the mixer. One thing / set of things to keep majorly in mind about the LEDs is what TYPE they are! I myself for at least the last year, use ONLY super brights. They're the ones that will put out their full intensity with 2 mA of current. They're also a little more expensive than the standard LEDs, having been around for 30+ years that require 20-30 mA of current. Now - your output signals are rarely ever going to be right against the power rails ... (the exact same voltage as your power supplies) ... and the 'standards' appear to be +5V, +/-5V, +10V or +/-10V for audio and CVs. In the Lunetta world of course, the (cough cough) 'standard' will more often than not, be what's coming out of your CMOS. And that, will depend on what you're powering it with - minus the small percentage of headroom from the CMOS chip itself. The above values though are a good frame of reference for powering your LEDs and the sizes of resistors to use, to keep them within their limits. 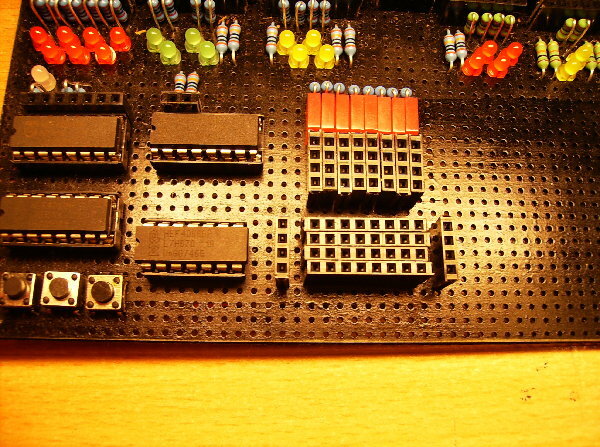 I myself - running +/-15V for everything, use a 10K resistor for each of my LEDs (of which I have a LOT. Well over 100 at the moment.) The 10K resistor will send my super bright LED, a maximum of 1.5 mA, and they're more'n bright enough for me. If you power your Arduino from a PC USB port it can deliver a max of 500 mA minus what the board is using itself. But most USB ports do not guarantee 500mA. 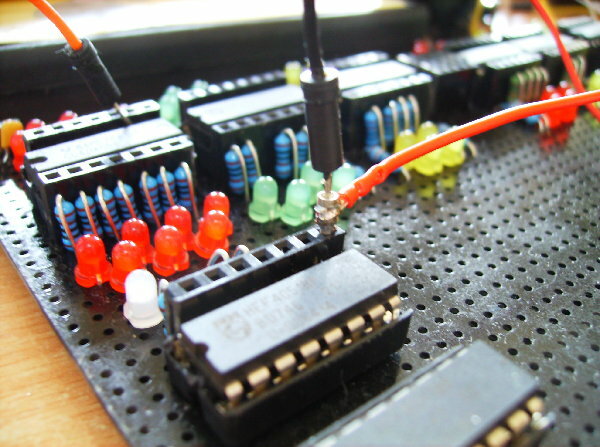 If you power your Arduino with an external powersupply then that supply or the voltage regulator on the Arduino is the limit. 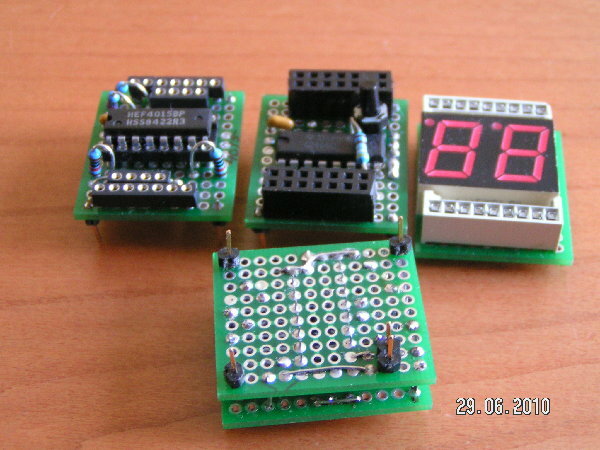 Without heatsinking the Arduino voltage regulator is said to be able to handle 300 - 400 mA, with heatsinking more. that again is a great piece of info there rich! I just bought a 100bag of 1k resistors so I guess I'll be using those. thanks for that mikmo. The arduino board is just there because I have one and it works good for testing. Since the board is expanding and the op-amp section is going to be easier with bipolar supply I'd better do it right and build/buy a +/- 12v and +5v secure power supply. Im very keen on keeping it safe because Im very clumsy and dont want to get a shock from touching the board. What kind of design would you suggest? The full on summer has finally arrived here in Holland and as every year the heat just shuts down my body and mind so Im taking a break from building for now. I did manage to solder a prototype for a new mini bananajack I was thinking of. Ive always been a fan of stackable bananajacks but they are way to expensive for my simple project, so I removed the plastic from a header pin and soldered some wire to it. Works really nice and they have a good fit with the male-male jumpers. Stackable male headerpins. Good idea! Some of my modules have triple outputs and still I want more. some remarks: I've used three versions of female in/outs on my Lunetta. 1: those that come on a strip that can be cut to size, looking like yours.However, when these were cut and plastic fractured sometimes, the inside metal bit was a fork like pinching system that needs the plastic support. 2: cut up IC sockets that I have. I used the big ones for IC's I'm not using anyway (for processors and such). 3: Old computer flatcable connectors (look the same as your females, but are a double row). Nice and cheap (made from free cables that is), and a bit of work I happen to enjoy. When the flatcable is removed the connectors have these small fork like little pinchers that pierce through the flatcable to make a solderless connection. These are a bit too close for circuitboard spacing, so I had to bend them a bit. Also, they are a bit short, so barely pass through the PCB. But so far I've managed to get good solderjoints. I think the double row looks better than two single soldered together. Those stackable cable headerbits you have used actually look like the pins you get when you break away too much plastic when cutting up machined IC sockets. Now I cut these up a pin larger then I want, because they break easily. I've actually kept the loose pins I got this way, I sorta felt those could come in handy for some purpose . Yeah, those are the ones I use for most of the headers on the board, they are cheaper then the machined ones but you sacrifice one pin with every cut. these are the ones you need, they contain a seperate socket for every pin inside a plastic casing. Ive seen them at 2 dollar for 40 pins, with some wire that makes 3 dollar for 20 jumpers! Some of my improvised female in/out's. thanks electri-fire, I have some flatcable lying around so ill get around to using it. I really like your layered design for the melodygen, so nice and clean. Does it plug straight in the board or do you have some headers for it? 2 new samples today, the patches are getting more and more interesting with every module I add. This one uses all 4 exor gates on my newly added 4030 to generate a complex data stream wich is fed into the melodygen and the data on the 4015 shift register. The outputs of the 4015 are used to drive the ABC on the melodygen. Theory is nice, but noise is better. 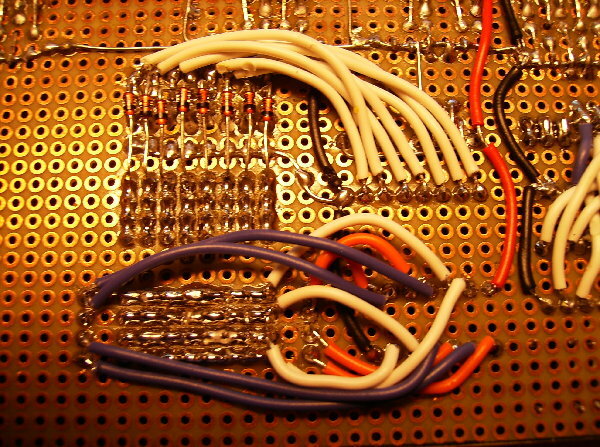 Since Im still using my breadboard to divide the power I always try a starvepot at the end of a "session", It's a cheap trick with great sonic potential. This made me think about rerouting the powersupply to header pins for all the chips wich can be easily done....hmm. If the weather allows me tomorrow I'll get that damn mixer done . Although the building has ground to a halt I just can't stop patching and "playing" this incredible machine! Sometimes I forget the time and I just get sucked in, then when I finally switch it off I need a few minutes to come back down to earth . This one was really weird, It's basically the same patch as noisemanifest but when I kept starving it it started to spit out this strange (and very unpredictable) "melody". There are a lot of hidden gems to be found with starvepots. That's great General Tjookum! Looks and sounds like a space craft in the dark. I'm seriously thinking about putting a socket and switch on each of my panels for power starvation. It seems like an option which cannot be overlooked. I know what you mean about coming down to earth. I've had my lunetta bleeping all day. I only just turned it off after 15 hours of fun so I could listen to your video sound. There's something good about these mini lunetta builds with the exposed board and pin sockets. Appears to have branched into a category of its own. Makes this hobby/obsession more affordable! However, I'm going for a modular panel approach. Been designing the look of my machine all day! It's about all I do with my life now! The sun has been pretty relentless here and couldn't get anything done the last 2 weeks. Although I couldn't do any soldering I did design my first ever module to have the center space on my board. I posted a question over at the deathlehem forum about a sequencer where you can plug in any sound and have it sequenced. With great help from Rfeng and mr Rykhaard it started to take shape very quickly and my first lunetta design was done before I knew it. 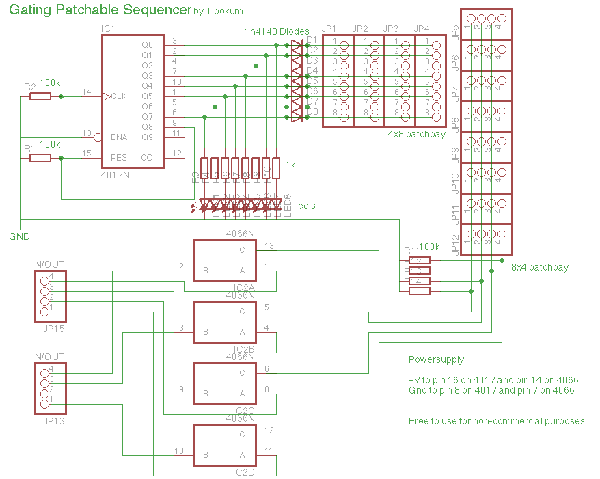 Ive called it the Gating Patchable Sequencer(GPS) and it uses just 2 IC's, the 4017 and the 4066. The 4017 is set up just like a baby8 and uses an external clock and/or reset signal, the 8 steps get routed to some led's and a 8x4 header patchbay with diodes to prevent feedback. The 4066 takes it's 4 control signals from a 4x8 patchbay to switch(gate) the 4 inputs and outputs. It's all very basic stuff and really idiotproof to build but with a lot of rythmic potential with a total of 32 possibility's and you can use anything as a sound input(circuit bend stuff, gates, oscilators) and have it sequenced on the output. It is fully functional but Im having some grounding issues in the patchbays so the schematic will be altered to a final version. well, technically it doesn't make any sound at all, it just switches sounds on and of based on an 8 step sequence. So the results all depend on what you put in and how you make patches with the matrix. In this video I used several osc. with XOR gates to make the clock very irregular, so the steps always trigger differently. I then used a melodygen and patches it to 3 different gates with different oscilators. All 8 steps are used and you get to choose wich gate goes to the output with the matrix. This is just one of endless possible patches, but hopefully it gives a general idea as to how it functions. Given the speed of your progress and the vast amount of cool stuff you post you can hardly be called an absolute beginner anymore. As threads progress, at times I´ve felt the urge to change the title, but I don´t think it´s possible. Could this be made possible by the forum moderators? Tjookum! THAT, is simply AMAZING! Major pats on the back for THAT one! And that is a great example of 'chopping' the audio, with switches instead of going with VCAs! That works absutively phenomenally! I couldn't have done it without the help you and others gave me. To be honoust Im kind of impressed myself . I've always wanted to create my own instrument for my own music(electronics/noise) and I can't be happier with all the help I have been getting here to make this dream come through. I have zero background in electronics and would never have thought I could make stuff like this 6 months ago, so a BIG to all the people here at EM. 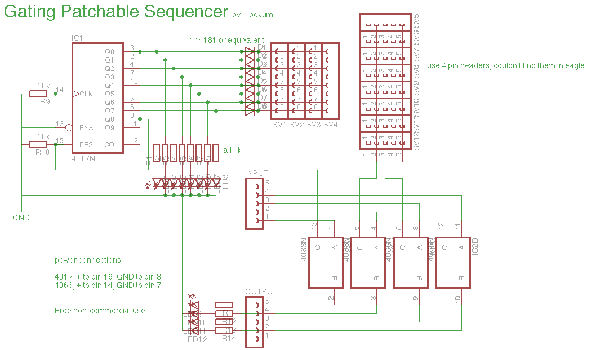 I have redrawn the entire schematic, and it's fully tested and working now. YES it has gone quiet! I was beginning to wonder if anyone would post here again. Perhaps people have moved on to other things, like acoustic guitar! Thanks for the update anyway! I shall be doing some 4017 sequency stuff, but at the moment I've got a long list of other modules waiting to be assembled onto boards. That looks like a fun module to make, tjookum ! I'll keep it on my "Things to Do When I'm Done Changing Diapers" list .